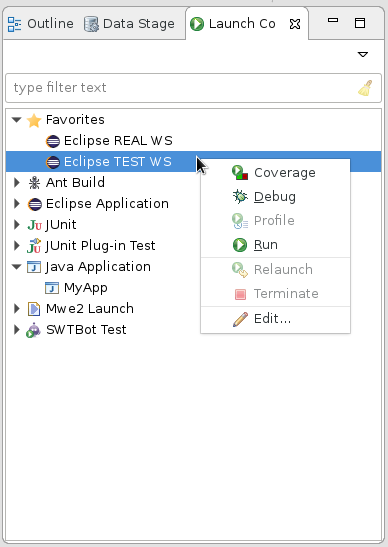 The Launch Configuration View is a standalone view that can display and control all different kinds of Eclipse Launch Configurations. The view can easily be extended (through Extension Points) to also display and control Launch Configurations from different sources (see https://github.com/mduft/lcdsl or https://marketplace.eclipse.org/content/launch-configuration-dsl) for an example. The LcDsl can display not-yet generated launch configurations in the view and allows seamless integration. By adding the following code below to your website you will be able to add an install button for Launch Configuration View. Honestly, I think this is a must‑have for your Eclipse environment. Amazing tool and just what I was looking for. Well, that is a bug :) I created https://github.com/mduft/lcdsl/issues/17 based on your comment to track it. Launching selected configuration on couble click will be very useful.